This is a recipe I got from a co-worker many years ago. It was her mother's recipe so, according to my math, it would have to be about 100 years old. I have changed it very little, cutting back on sugar and salt and making it in a food processor instead of lots of chopping and whisking. 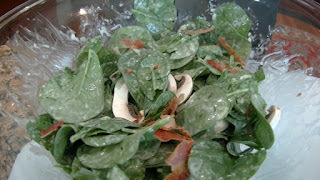 For the salad itself, you want baby spinach, stems removed, sliced mushrooms and crisp-cooked bacon, crumbled. The amounts depend on how many you are serving. To turn this into a main dish for lunch, just add some hard-cooked eggs.